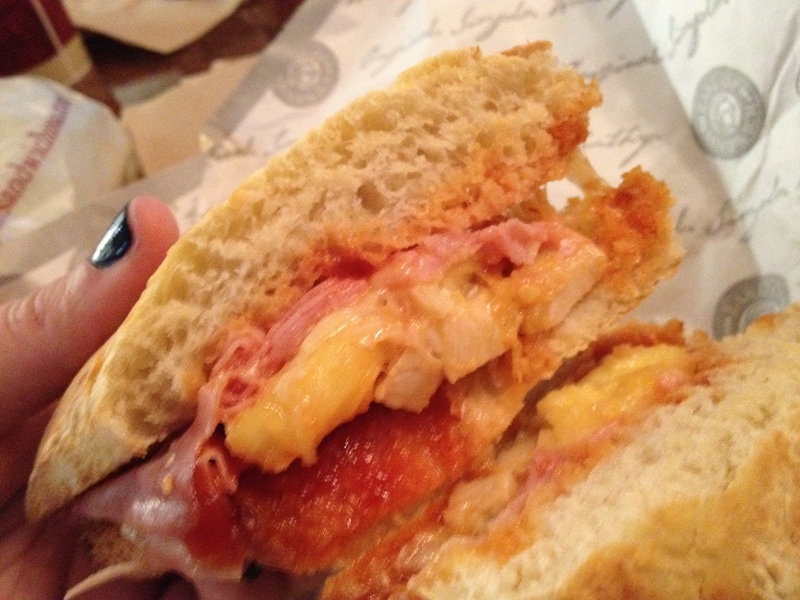 earl of sandwich | DidjaEat? So, as you may or may not know, I live in Philly, aka Sandwich Capital Of The World. We have the best sandwiches, the best bread, the best selection and the best sandwich makers in the world. I will pause here for guffaws from people of different cities. Ok, so, yes, we do it right and we do it above and beyond. When you live in sandwichland, it is hard to eat sandwiches other places and not be let down (this is why I would like to buy the Subway sandwich chain and put it right out of business. And then chase Jared with a pitchfork to Canada…but that’s another story for another day). I have come to accept that when I am in other cities and I get a sandwich, it is just sustenance, not anything to be enjoyed. I spent 7 days in Disneyworld with my Aunt and cousins. One day I went with my Aunt to Downtown Disney to do some shopping. Downtown Disney, if you didn’t know, is a plot of land chock full of shops, some Disney themed & some not and restaurants of all shapes and sizes. For instance, there is a Wolfgang Puck there (I ate there and wasn’t very impressed. There should be no mold smell anywhere in your restaurant. I am talking to you, enclosed porch area. ), a Rainforest Cafe, a House Of Blues, a Fulton’s Crab House, you get the picture. 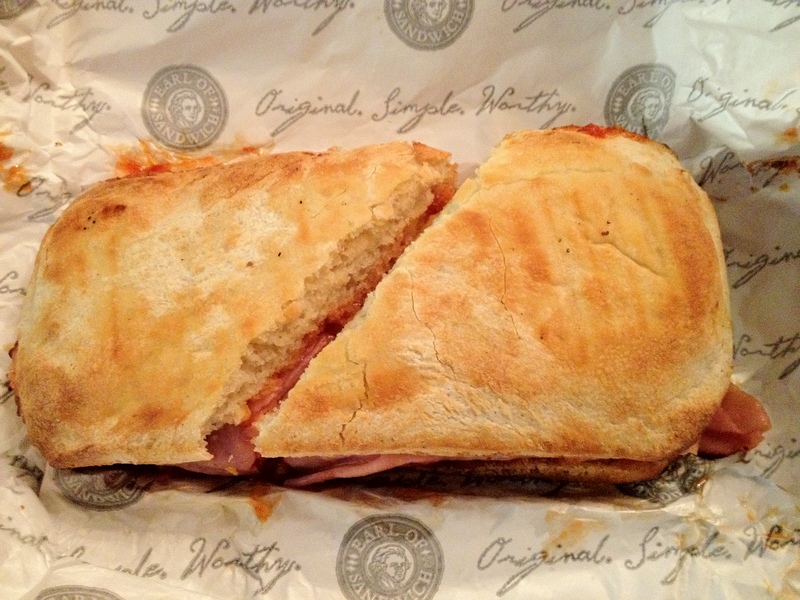 There are also a few quickie type places, and Earl Of Sandwich is one. It was hot, I was tired and we just wanted to eat. I thought the place was a sit down and when we walked in, we were a little taken back. It is more cafeteria style ordering, and the line was loooong. But to our surprise, it moves quickly because you order on one end of the counter, just the sandwich (or salad or soup, the big stuff), and move along to the other end where you pick up a dessert or a side (like, say, potato salad) and slide on down to the cashier where you pay for everything as well as a drink and/or slushie. They give you a pager and you hang out while they make your sandwich and page you. The pictures on the boards hanging about looked delicious but we all know food magic can be done via crafty photogs. Once the pager went off, I skipped over, picked up the bag and slid back into my seat. I have never been so happy to have my expectations shattered. Earl Of Sandwich makes little loaves of bread (to those of you familiar with Wawa, they are about the size of a Shorti. Those of you who are not familiar with Wawa, I am sorry for you.) about 6 inches long. 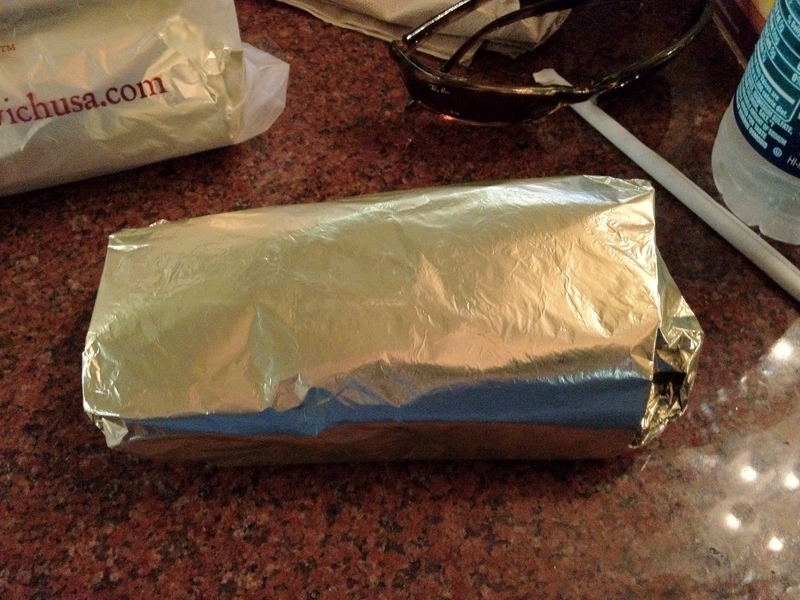 They warm the sandwich up and wrap it in a foil wrap to keep it’s heat, altho I gotta say, it won’t last long. I ordered the Hawaiian BBQ sandwich. 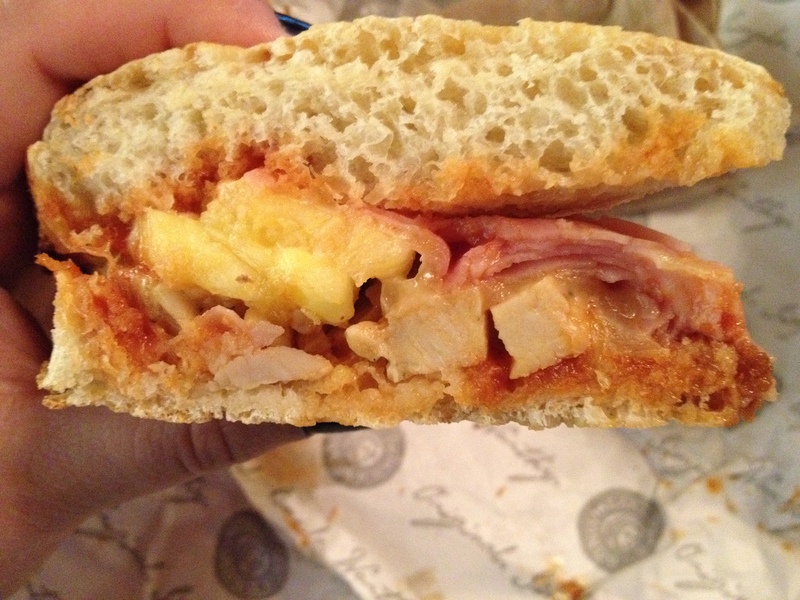 This thing had Grilled Chicken, Roasted Ham, Aged Swiss, Fresh Pineapple & Hawaiian BBQ Sauce. It could have been a hot mess, and not in any kind of good way. The chicken could have been dry, the ham could have been lunch meat crap and the Hawaiian BBQ sauce? God knows. So I jumped in. I unwrapped. The bread was still warm and soft, but it seemed sturdy. Cut on a bias, so I could peek in, it smelled delicious and I had to restrain myself from just stuffing it right in my face in order to take some pictures! The chicken was shockingly juicy. It has absorbed some of the fresh pineapple pieces, that did not fall right out of the bread. The ham was cut thin, but you can tell they make that ham there, and don’t just ship it in and open up a cryovac bag. The star of the show was the BBQ sauce. It was sweet without putting you in a coma, with a nice tang that the pineapple compliments. There was just enough to soak a little into the bread without making it soggy but enough to mix in with the ingredients. I have to hand it to the food guys in the bog offices at Earl Of Sandwich, this was a kickass sandwich. But the star, the real shining star of this beauty is the bread, called “artisan loaf”. I don’t know exactly what they means, but it was able to hold that crazy, juicy delicious thing all together without falling apart. The texture is almost like a southern biscuit but still slightly buttery and not ridiculously chewy. I don’t know how much R&D they put into that bread but BRAVO! I also ordered 2 sandwiches besides the Hawaiian, to keep in the fridge at the hotel for late night eating. One was “The Original 1762″ (Freshly Roasted Beef, Sharp Cheddar & Creamy Horseradish Sauce”) and “The Full Montague” (Freshly Roasted Beef, Turkey, Aged Swiss & Sharp Cheddar, Lettuce, Roma Tomatoes & the Earl’s Mustard Sauce). I ate the Original the next night after a particularly long day at The Magic Kingdom. It melded together into, and I am not exaggerating, a sandwich fit for the Gods. I didn’t even warm it up, the roast beef and horseradish sauce mingled together with the cheese and the bread held together perfectly. I ate the Montague the day after that for lunch and still, fantasticalness (yes, that is a word). Mustard sauce didn’t get lost in the bread and even the lettuce (Bib lettuce I believe) was great! I have never had a sandwich so good outside of my home area like this! And while I did not have the soup or the potato salad, my Aunt did and she raved about the potato salad and loved the soup. She loved that you could browse the salads and desserts in the line going towards the register, which is nice if you are picky about what something looks like or how fresh something is. We both thought the (lettuce type) salads looked awesome as well. Earl Of Sandwich, I implore you: please come to Philly, beyond our airport (or which you do have a stand and I have, more then once, thought about driving there just for another bite of your deliciousness). Philly will embrace you. You do it right, unlike other sandwich chains *coughsubwaycough* and make them look like fools.